• The United Nations has declared 2019 as the international year of the periodic table of chemical elements. On December 29, 2018, Dr. Shoichet chats with Nana aba Duncan of CBC Radio on the importance of the periodic table. • On Friday December 29, 2017, Molly Shoichet was appointed as an Officer of the Order of Canada. • Dr. Shoichet is joined by Martha Crago, McGill University’s vice-principal of research and innovation, and Paul Davidson, president of Universities Canada, at the Economic Club of Canada's lunch-time panel discussion on research, innovation, and the new economy. • On Tuesday October 10, 2018, Dr. Molly Shoichet joins Matt Galloway at CBC Metro Morning to talk about the Artful Science exhibit that is taking place at Toronto's Pearson International Airport. • On Saturday September 15, 2018, Dr. Shoichet gave the keynote address to Schulich Leaders and described the importance of embracing your inner geek. 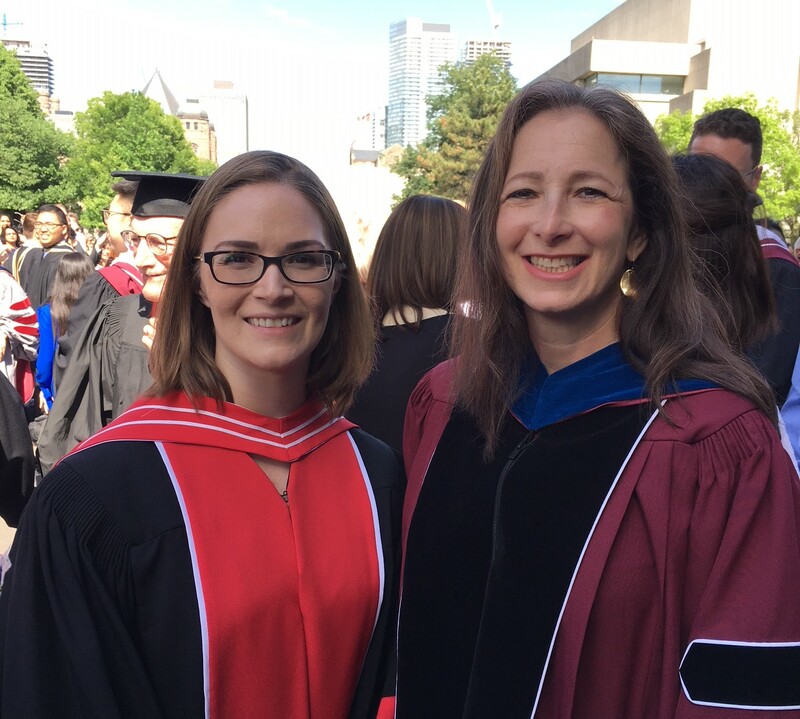 • Congratulations to Stephanie Fisher, PhD who convocated on June 19, 2018 and now works at BlueRock Therapeutics. • Dr Shoichet on how to build a culture of science in the March 2018 issue of Maclean's. • On Wednesday December 7 at 7pm, Dr. Shoichet delivered a public lecture at The Perimeter Institute on how her lab is engineering new strategies to combat cancer, blindness and stroke. Dr. Shoichet's lecture begins at about 23 minutes into the program. • On Tuesday December 6, Dr. Shoichet spoke about her research on TVO's The Agenda with Steve Paikin. Post City Magazine is a Toronto magazine that covers 7 neighbourhoods in the Greater Toronto Area. In their December 2016 issue, they looked back at the most inspirational people of the year, and included in their selection is Molly Shoichet. Dr. Shoichet is featured in NOW Magazine's (Oct 19, 2016) online site regarding the numerous awards she has been winning. Molly recently won the 2016 Till & McCulloch Award, which recognizes Canadian stem cell researchers, for her studies related to the use of hydrogels for stem cell transplantation..
On Sunday October 9, 2016, Dr. Shoichet is inducted into the National Academy of Engineering (NAE), as a Foreign Member. Dr. Shoichet is awarded the 2016 Till & McCullloch Award. The award recognizes both Dr. Shoichet's contributions to global stem cell research, and her 2015 paper on the use of hydrogels for stem cell transplantation as the most impactful stem cell research publication authored in Canada in the past year. On September 26, 2016, Dr. Shoichet sits down with IMS and is features on their Raw Data Podcast. The Aug 8, 2016 issue of the Toronto Star features the Shoichet lab's cell transplantation research. In the article, Dr. Shoichet talks about the long process of turning scientific breakthroughs into clinical treatment available to patients. • Dr. Molly Shoichet celebrates and shares the success of researchers establishing the new frontiers of science. • RegMedNet - Molly Shoichet discusses her career and experiences as a woman working in STEM. • Elle Québec - In the March 2016 issue of Elle Québec, Molly Shoichet shares the spotlight with Ms. Piggy, in being named one of 32 inspirational women of the year. • SuperheroYou - Molly Shoichet shares the spotlight with 8 other real-life female superheroes. A one-on-one with Molly Shoichet. Hamideh Emrani met up with Molly and their interview is featured in Signalblog website. University of Toronto researchers have found a way to embed drug compounds in nanoparticles so that they are released into the body at a controlled rate. In an article published in Science Advances, Malgosia Pakulska, Irja Donahgue Elliott, Jaclyn Obermeyer, Anup Tuladhar, Christopher McLaughlin, Tyler Shendruk and Molly Shoichet demonstrate how therapeutic drug proteins can be guided to the nanoparticle by purely electrostatic interactions between the protein and the nanoparticle's surface. University of Toronto researchers may have solved the problem of protein binding. In a review paper published in Science, Drs. Malgosia Pakulska, Shane Miersch and Molly Shoichet demonstrate how the disparate fields of computational biology and antibody engineering can be used to solve big problems in protein delivery. Molly Shoichet is elected to the National Academy of Engineering (NAE) as a Foreign Members, for contributions to neural tissue engineering and design of polymers for cell and drug delivery. In the January 23 2016 issue of the Saturday Star, Dan Taekema writes about what makes Canada cool. It's not all about what is hip to be cool, but the great science that has come from the Great White North. In the Dec 2015 issue of Chatelaine, Molly Shoichet is included in their list of Women of the Year. Molly Shoichet is interviewed by science/tech journalist Kris Abel where she talks about regenerative medicine and shares her love and passion of science, and how this has led to many of her many achievements. Molly Shoichet receives national Fleming Medal for outstanding scientific outreach. Professor Dame Carol Robinson, Oxford University, delivers great research seminar as Irving O Shoichet lecturer at UofT, Chemical Engineering. Carol was L'Oréal-UNESCO for Women in Science Laureate for Europe when Molly was the L'Oreal-UNESCO For Women in Science Laureate for North America in 2015. Anup Tuladhar's exciting research on local delivery to the stroke injured brain is highlighted. Can stem cells reverse brain damage? Behind the scenes of Medicine by Design with Molly Shoichet and Peter Zandstra. Molly discusses "Medicine by Design" grant to UofT on CBC's Metro Morning with Matt Galloway. On Thursday June 4, 2015, come and join us for a great afternoon of talks. We have a stellar line up of speakers who will join Molly in honour of her appointment to the rank of University Professor. On Tuesday May 12, 2015, come and join us for an interactive symposium that demonstrates how sport science, research and technology at UofT intersect to bring out the best in high performance athletes. The symposium is free, but registration is required. Congratulations to the Shoichet lab ladies who cleaned up winning 4 awards at CBS! University of Toronto researchers show that engineered 'hydrogels' not only help with stem cell transplantation, but actually speed healing in both the eye and brain. Is Tim Hunt typical or outrageous? Rubbing shoulders with "The Great One" at the Parachute Gala to raise awareness and funding for injury prevention. (Shown from left to right are Molly Shoichet, Wayne Gretzky, Zoey Shamai). 3D hydrogel chemistry is being used to better understand a rare lung disease. At a recent celebration to raise awareness and funds for this research are Bill Stanford, Alexander Baker, Stephanie Fisher, Laura Smith, Roger Tam, and Lisa Jullian. Special thanks to Caley Taylor for the picture. Canadian Research, Molly Shoichet, wins L'Oréal-UNESCO for Women in Science Award. Included are several media sources that have captured this honour. On Monday January 19th, 2015, President Meric Gertler and Provost Cheryl Regehr hosted a reception in honour of the University's newest appointees. Congratulations to Molly Shoichet on another poignant moment in your academic career. Our collaborator, Dr. Cindi Morshead, discusses our stroke research in the publication "International Innovation". The journal provides the opportunity to communicate science and demonstrate impact and relevance to the wider community of stakeholders including funding agencies, scientists, government, and the general public. Molly Shoichet is included as one of the six UofT engineers who is embracing entrepreneurship and commercialization. Shoichet lab hosts visitors from Karolinska Institute in November 2014. Congratulations to Katarina Vulic on successful completion of her PhD! We wish Katarina all the best at Novartis. Molly speaks at Katarina's convocation on the importance of staying in the game and taking risks. We would also like to thank Lesa Holmes for the pic. The Honorable Minister Lake visits the Shoichet Lab and engages in a discussion on the importance of research. Molly speaks at Rice University's bioengineering research centre in November 2014 where she met with Shoichet lab alumna, Meng Shi (centre), and Tony Mikos. Congratulations to Molly Shoichet who has been awaded the highly prestigious designation of University Professor by the Provost of the University of Toronto. The designation is bestowed in recognition of great scholarly achievement and pre-eminence; it is an exclusive appointment that is made to no more than 2% of tenured faculty. Congratulations to Professor Molly Shoichet who was named as Senior Advisor on Science and Engineering Engagement. Nature profiles the Shoichet lab's research on hydrogel drug delivery system. Mike Cooke demonstrates rapid gelation of HAMC hydrogel to Molly Shoichet. Shoichet lab featured on Global News with Catherine Lawrence where Dr. Christopher McLaughlin and Ms. Stephanie Fisher are examining LAM cells. Stem cell infographics, courtesy of the Ministry of Research and Innovation. Congratulations to Molly Shoichet who is the recipient of the prestigious 2014 Senior Scientist Award from the Tissue Engineering International & Regenerative Medicine Society - Americas (TERMIS-AM). This award recognizes her significant contributions to the field of tissue engineering and regenerative medicine. Contratulations to Jennifer Logie who won the best poster award in the ACS Colloids & Surfaces Division, at their Fall meeting in San Francisco, CA. Drs. Molly Shoichet and Derek van der Kooy finding ways to cure blindness. Alumni, Dr. Jeffrey Karp uses nature and the environment to bring his lab's science and research together. "Click Conjugated Polymeric Immuno-Nanoparticles for Targeted siRNA and Antisense Oligonucleotide Delivery", by Diana Chan, Glen Deleavey, Shawn Owen, Masad Damha and Molly Shoichet was downloaded 915 times since August 2013. "Polymeric Micelle Stability", by Shawn Owen, Diana Chan and Molly Shoichet was recognized by ScienceDirect as one of the Top 25 papers published in Nano Today in 2012. On April 24, 2014, the Shoichet lab participated in Laugh out LAM – an event spearheaded by Catherine Lawrence to raise awareness and funding for a rare lung disease. Special thanks to Caley Taylor for the pictures. Molly Shoichet leads one of the four NSERC CREATE projects that was awarded to the University of Toronto. The NSERC CREATE in Manufacturing, Materials and Mimetics (M3) provides graduate students working in the areas of Cell Manufacturing, Biomaterials, Tissue Mimetics an innovative approach to graduate education, combining cutting edge research with soft skills and industry experience. Molly Shoichet's Tier 1 Canada Research Chair in Tissue Engineering is renewed. Molly Shoichet wins the Queen Elizabeth II Diamond Jubilee award in recognition for her excellence in advanced research and superb service to the community. Special thanks to the Office of the Lieutenant Governor of Ontario and to photographer Janis Rees for the pictures. In September 2012, Molly Shoichet was inducted as a Fellow of the Canadian Academy of Health Sciences. With this latest honour, Dr. Shoichet is now the only living person to be a fellow of three prestigious Canadian Academies: The Canadian Academy of Sciences of the Royal Society of Canada, the Canadian Academy of Engineering and the Canadian Academy of Health Sciences. Molly's seminar at ISSCR draws attention from the press. Supporting vision research, Molly Shoichet attends Comic Vision with collaborator, Prof Derek van der Kooy, and philanthropist, Mark Krembil. Highlights of Biomedical Materials, which contains a compilation of the best papers published within the last two years. Included is Molly's publication with Malgosia Pakulska and Brian Ballios. Molly Shoichet is featured in a special section on "Repairing the Brain" in the Winter 2013 issue of Edge Magazine. American Association for the Advancment of Science (AAAS) Molly Shoichet speaks at AAAS panel on stroke research. Here pictured with former grad student, Jeff Karp (Professor at Harvard Medical School), Julie Payette (Canadian Astronaut), Suzanne Fortier (President, NSERC) and Chad Gadfield (Present, SSHRC). Dr. Catherine Coleman, NASA Astronaut, visited the Shoichet Lab after giving a seminar in the Lectures on the Leading Edge seminar series on January 9, 2013. Biomaterials Science welcomes Molly Shoichet and others to their Editorial Board. Yukie Aizawa's Biomaterials' publication was featured in the McEwen Centre for Regenerative Medicine's June 2012 newsletter. The April e-newsletter of UHN features a paper with the collaborative efforts of the Shoichet and Fehlings' laboratory, entitled Spinal Cord Injury: Reducing Inflammation with a Smart Material. In the March 27, 2012, issue of the Globe and Mail, Diana McLaren explains a new tool that tracks people in academia based on their H-index. And scoring on this chart, in the discipline of Biological Engineering, is Molly Shoichet. Katarina Vulic's J Am Chem Soc publication was featured in the McEwen Centre for Regenerative Medicine's February 2012 newsletter. Molly Shoichet is named to Ontario's Highest Honour. Congratulations to Ryan Wylie for his paper published in Nature Materials and to Ryan Wylie and Karyn Ho for their artwork featured on the October 2011 cover. Congratulations to Malgosia Pakulska for winning a prestigious Vanier graduate scholarship. Malgosia was featured in the national McLean's magazine and the Engineering website. Molly Shoichet is among four faculty members from the Faculty of Applied Science and Engineering at UofT to receive support from Canada's new Collaborative Health Research Project (CHRP) program. Molly Shoichet shares details of her life and passion, and how it has led to great advancement in tissue engineering and spinal cord injury repair. Molly Shoichet, a biomedical scientist at the University of Toronto who holds the Canada research chair in tissue engineering, described a "growing momentum" in the bio-engineering field as collaboration increases between engineers, biologists, and surgeon scientists. Nafees Rahman's Biomaterials publication was featured in the McEwen Centre for Regenerative Medicine's August 2010 newsletter. • Molly Shoichet and her research was recently featured on NSERC's website. If your link should ever become broken,please click here. • In September 2009 the University of Toronto launched a recruitment campaign featuring Faculty and graduate students. Professor Molly Shoichet, and one of our doctoral students, Douglas Baumann are among those featured. The footage shot during these interviews, edited to 30s commercial form, has appeared on national television. Longer versions have also been posted to You Tube by the University. Links to interviews with Professor Shoichet are given below. Additional footage and biographical information is available at www.thisisuoft.utoronto.ca. Molly Shoichet was awarded the Clara Benson Award at The Canadian Chemistry Conference and Exhibition. The award is in recognition of a distinguished contribution to chemistry by a woman while working in Canada. The conference and celebration took place in June 2009, in Hamilton. • Molly Shoichet was profiled in the Pre-Sping 2008 issue of Lifestyles Magazine. • A major Chinese channel (CCTV-10) went to visit several Canadian universities. In this video, UofT is featured. About 5 minutes into the video, we can see some of the members in our lab, including Molly, Meng, Laura, and Yukie (just to name a few). • Molly Shoichet has the honour of becoming a fellow of the Royal Society of Canada. • Molly Shoichet has been elected to the Academy of Science of the Royal Society of Canada. Election to Fellowship in the Society is the highest academic accolade in Canada that is available to scientists and scholars. Molly's citation reads as follows, "Molly Shoichet is an innovative and influential scholar working at the interface of chemistry, biology and engineering who seeks to advance fundamental science, while at the same time translating this knowledge into advanced human health. Molly is internationally acclaimed and recognized for her outstanding research and leadership in these multi-disciplinary fields." • On February 20, 2008, two of University of Toronto's Chemical-Engineering profesors, Molly Shoichet and Elizabeth Edwards became recipients of the Killam Fellowship Award. You can click here to see the feature done by Aisha Greene of The Varsity, or here for a link to the PDF file. • In the January 12, 2008, issue of the Toronto Star, Peter Calami reports on the Canada Research Chairs program and its impact to professors in universities across Canada. In Peter's article, entitled "Brain drain? That's so nineties", the University of Toronto tops the list of universities to have professors being recipients for this prestigious program, and Molly Shoichet is highlighted as the "poster woman for a national success". • Not only is it exciting to have Jordan Wosnick and Molly Shoichet's "Three-Dimensional Chemical Patterning of Transparent Hydrogels", appear in the 20th Anniversary volume of Chemistry of Materials, but the artwork of Ms. Hyun Joo Lee, was also featured on their front cover! • In the January 5, 2008, issue of the Globe and Mail, Tenille Bonoguore gave an in-depth look at how Toronto - specifically within the University and College Streets area - is a mecca for Science. To get a pdf version of the article published on the Globe and Mail's website, please click here. • A major focus of the 2007 year for the University of Toronto pertains to recruitment strategies. In one project, three students from our lab were invited to share their thoughts and impressions of UofT. Please click here to to get to the page with the links. Unfortunately we do not have direct links to these videos. You may also have to download either RealPlayer or Windows Media Player to view these. to learn how there is "Engineering Hope in the Laboratory and the Marketplace". • Molly is profiled in ACS Chemical Biology's August 18th 2006 issue of Ask the Expert feature. • Ying Luo's study was featured in the April 2004 issue Nature Materials - for a preview of the story, please click here. • From The Times' special section on Life Sciences, featuring several professors at the University of Toronto. Towards the left of the screen, there will be a box with the caption "Listen Again". Please click on "Listen to 27 May" to hear the broadcast. Please Note: Real Player may be required to listen to this. Molly's excerpt is roughly between 13:09 and 18:04 of the 30 minute broadcast. • We would like to thank the photographer, Andrew Williamson, who has captured some beautiful shots of Molly as she was giving her presentation. Tanis Haas, editor of a health and wellness newsletter, MeDCAN, spoke to some speakers of TEDxToronto where she has shared how they stay healthy while making waves in their research and outreach. • This year, the theme of the 2015 conference is Thresholds. • Molly Shoichet is interviewed by 680 News where she discusses her research which is to be featured at TEDxToronto. • TEDxToronto 2015 announces first round of speakers. • Social media campaign aims to raise profile of Canadian research. • DiscovHer: How 1 researcher + 1 film-maker are making research a reality for 1,000s. • On Monday May 11, 2015, Molly Shoichet was interviewed by Matt Galloway of CBC Metro Morning. In a November 2011 convocation, Mrs. Dorothy Shoichet received an honourary degree. Beside the photo, is her daughter, Dr. Molly Shoichet as the "beadle" from when her Mom received her honorary degree. • Another successful day. Thank goodness the raining weather passed and brought in some needed sunshine. • SBeRT have done it again!! • In 2007 the Shoichet Group won the Wheels in Motion Community Wheelchair Relay at the Docks in Toronto. The large silver bowl and individual gold trophies (above) were awarded to the five members of our "A Team"; while both the A and B Teams received beautiful gift baskets for winning their respective heats. In the finals the A Team won with a time of 2:44 while the B Team was fifth in 3:18. In addition to the relay trophies the Shoichet Group also placed 2nd across Canada in the Community Relay Fundraising Category. • Shoichet Group would like to thank SARSTEDT for financial support and MEDI-Chair and Shopper's Home Health Care for their expertise and generous donation of racing wheelchairs. The Team would also like to extend heartfelt thanks to our friends, family, and colleagues for their support in 2007. • This year (June 2006), the Shoichet group put together a corporate team, Shoichet Bioengineering Research Team. Along with the excitement of creating a team, Molly and her son (Emerson) were quoted in the Toronto Star. Please also find this beautiful thank you letter attached. • Rick Hansen's Wheels in Motion (June 2005) - please click here to see some of the beautiful moments captured. • June 2016 - ShoichetLab alumnus, Prof Yen Wah Tong of NUS, returns to UofT for a seminar on peptide amphiphiles. • May 2016 - This year's World Biomaterials Congress (WBC2016) was extra-special, as it brought together a Shoichet Lab Reunion. • March 2016 - Congratulations to Dr. Jiao Lu (PhD 2012) and her husband who are proud parents of a baby boy. Yutaro Ohara was born on October 6, 2015. • April 2015 - Congratulations to Dr. Katarina Vulic (PhD 2014). Katarina was recently offered the position of Senior Scientist at Novartis Insitutes for BioMedical Research. This comes off the heels of her having a relatively short intern placement at Novartis during which she excelled and she was also awarded a Novartis Spot Award. Her intern placement at Novartis is a position that she gained from being one of our first NSERC M3 award recipients! • July 2014 - Congratulations to Dr. Yuanfei Wang (PhD 2013). Yuanfei was recently offered the Life Sciences Consultant position at Putnam Associates, a Boston-based pharma-biotech strategy consulting firm. • July 2014 - Congratulations to Ms. Ankeeta Tadkase (BASc 2010), who has just graduated from medical school. She is now starting her residency in the Family Medicine department, University of Toronto. • April 2014 - Congratulations to Dr. Paul Dalton (PDF, 1999-2002), who together with his family have moved to Germany, where he has now taken on a Full Professor faculty position in Biofabrication at the University of Wuerzburg.